Kinda weird, but kinda cute at the same time. Amazing and adorable easy fiction book.If it doesn't make you tear up, you're pretty much dead inside. Oh, and there's an important moral to be learned from the story, but who cares. What a strange and lovely story. A good addition to a unit on friendship. Wilfred the hairy giant would like a friend to play with. The only other people around are the bald villagers in a nearby town. So one day he tries to join the children in the neighboring village in a game. But all of the children run away; except one. One little boy finds that having Wilfred as a friend is fun.But the other townspeople have other ideas. They would like hair on their heads. So when Wilfred comes back to play the townspeople tell him that only small hairy beasts are allowed. Since Wilfred can't become smaller they take his hair from him. Now Wilfred can't play because he's too cold.The young boy figures out that the townspeople have made wigs out of Wilfred's fur, and he's furious! He makes a pair of mittens from his bedclothes but loses them in a winter storm while trying to get to Wilfred's den. The townspeople find that he's missing and when looking for him find him wrapped up in Wilfred's arms. They are so ashamed of themselves that they sew Wilfred's suit back up for him. This is a cute story of friendship and I immediately fell in love with Wilfred. Wilfred is a huge, hairy giant who is lonely. He wants to have friends so he travels until he comes upon a village with individuals who are hairless. Noticing some children playing, he runs over to them as he wants to play with them but ahhh.... they all run away from big, hairy Wilfred, all of them except for one small boy. This boy tells Wilfred different things to do and Wilfred obeys him. They have the best time together and they can't wait to play again tomorrow. In the meantime, the town people are envious of the hair on Wilfred and come up with a plan to get the hair off of Wilfred so they can keep it for themselves. It's mean but the next day, they approach Wilfred and I am sadden at what transpires. The little boy stays true to his new friend and this ending is priceless. It is a wonderful story and one that will make your heart sing. This is a heartwarming tale of friendship and loyalty that all ages can enjoy. With lovable characters and a plot to cause giggles and "awww"s, Higgins has created a that will warm your heart and teach morals such as bravery, friendliness, truthfulness, and forgiveness. The illustrations in this picture book are colorful and fun to look at, and the facial expressions in the characters as well as the wat text and illustration are blended together add a whole other level on top of the text. A quirky story about a big furry giant, Wilfred, who encounters a village of bald people. Wilfred is treated unfairly, but fortunately he also has made a true friend. This is an evocative friendship story about trust, acceptance, and fairness. Wilfred is a must read for all ages! It tells the wonderful story about love, life, and friendship. Such a sensational book that will really play with you emotions. The content of the book is very truthful and has good morals within it. This is a book that every classroom should have. An adorable book, I loved reading this with my niece, a sweet giant wants to make a friend. What a sweet tale of friendship! I'll be sharing this one with my younger readers this week. Enjoyed the book. Everyone caring for each other in the end. A good story about friendship and the importance of not taking advantage of others. Weird, but sweet. Appealing, and also sorta ugly. I gotta admit, though, comparing it to Calvin & Hobbes seems to me to be a stretch. And to Dr. Seuss, more of one. Unusual and original story to show empathy, friendship, and loyalty.At first, the illustrations seems odd, and perhaps even a bit creepy, but they work.I look forward to sharing it with youngsters! School Library Journal( March 01, 2013; 9780803737327 ) K-Gr 3-In this offbeat story, a lonesome, furry giant visits an unusual town inhabited by people without a "single hair on their heads. Not even the ladies." Wilfred wants a friend, but he scares everyone away except for one brave boy. The odd duo have fun playing the ukulele and reenacting the Battle of Waterloo. With winter approaching, the townspeople hatch a nasty plan to stay warm. They decree that if Wilfred wants to visit, "he'd have to stop being big. . . or to stop being hairy." Of course, the only way for him to stop being hairy is to let the townsfolk cut off his hair. After spotting new wigs on his neighbors' heads, the boy grows suspicious. A snowstorm heading to Wilfred's cave puts the boy in danger, but the giant protects him. Remorseful, the townspeople sew all of their wigs into a "big hairy suit" for the hero, with a handy zipper down the middle. Wilfred is a gentle, endearing character. Higgins's affecting, digitally enhanced cartoon illustrations show the ostracized, shaven, and shorn creature huddled alone in his cave, warming himself by a fire as the boy races to bring him extra-large mittens made out of blankets. A heartening tale of friendship.-Linda Ludke, London Public Library, Ontario, Canada (c) Copyright 2013. Library Journals LLC, a wholly owned subsidiary of Media Source, Inc. No redistribution permitted. One point this review missed but another mentioned was that this story would lend itself well to discussions with older students about fairness, diversity and bullies. With redemption at the end of the story, I really think kids could relate. What originally attracted me to this book in the library was the illustration on the cover. It reminded me of my all-time favorite comic Calvin & Hobbes by Bill Watterson.Wilfred actually has quite a bit in common stylistically with illustrative aspects of Watterson's work. This is the story of Wilfred--a big, hairy monster-- and his search for a friend. Lonely and wandering, Wilfred comes upon a town inhabited by tiny, bald people. When he sees the children playing he wants to join in. When he approaches the children run away--all except one little boy. Thus Wilfred finds his friend.When the village adults abuse Wilfred's generous nature and naivete for their own greedy purposes it is Wilfred's young friend who comes to his aid. The fact that Wilfred's small friend is only referred to as "the little boy" helps keep the emphasis of the story on the gentle Wilfred and the message of kindness.This is a beautiful story about love, true friendship and forgiveness. It is an extraordinarily touching story in the tradition of both Max Lucado's and Mo Willem's work. The bright, often humorous, illustrations blend with the heartfelt text, meeting the youngest readers with an important message without patronizing them.After having read Wilfred I not only want to add it to my personal library I intend to share it with as many people as possible. I also intend to seek out further work by Ryan Higgins with whose work I am very impressed. Kindness and cruelty come in all shapes and sizes. That is the lesson that is learned with Wilfred. Calling Wilfred humongous and hairy is not an insult, it is true. Wilfred is lonely and looking for a friend when one day he comes upon a town of little bald people. Seeing the children playing, he wanted to join. Being different has it disadvantages, but one little boy was not scared. He approached this monster and they had fun together. After promising to return the next day, the little boy was sad when it friend did not return. Turns out the town of little bald people realized that Wilfred has something that they wanted and being the kind person he was Wilfred helped out these people with their nasty idea.Wilfred wanted to help, that is what a friend does. Little did he know that not all people have good intentions.The sad little boy set out to make things right, and if it was not for the kindness of this sensitive soul and a town wanting to right a wrong, a hairy humongous Wilfred would not have the thing that he always wanted – a very best friend. A delightful book to curl up with and read about friendship and caring; and not taking advantage of someone just because they have something that you want. Wilfred is a large, hairy monster whose loneliness takes him to a little town filled with little bald people. Most of them are terrified when Wilfred appears, but one little boy befriends him. Wilfred promises to come back to play, but the other little people have set their minds on acquiring Wilfred's magnificent pelt (there's a market for wigs). Wilfred is willing to part with his hair, but he finds it's too cold to leave his cave. When his friend doesn't appear, the little boy figures out what has happened and goes looking for him (with a huge pair of mittens). He gets lost and caught in a storm and Wilfred - hearing his cry of distress - rescues him. The townspeople feel pretty chagrined when they discover Wilfred and the boy shivering in the snow. They sew Wilfred's hair into a big onesie (now with a zipper!) and he's good as new and ready for more fun and games. Despite his loneliness and his brief stint being bald and naked himself, Wilfred's smile never falters. He's also willing to do pretty much anything - even if he's no good at it. Cute story and illustrations. I particularly enjoyed Wilfred's golfing outfit. Children's book #5SummaryWilfred is a big hairy giant who lives alone. One day he discovers a small town with bald people. Everyone is scared and runs away from him except one little boy who he quickly builds a friendship with. Some of the people in the town get together and develop a cruel plan to cut Wilfred's hair. This is because they don't think it's fair that he has hair and they don't. They tell him he can't come into their town unless he is hairless like them, so he lets them cut it off. After this incident, he doesn't return to the town because he is too cold and embarrassed. When the boy hears what happened, he realizes Wilfred will not survive the winter without his hair, so he goes on a mission to save him. ActivityWhile reading this book, stop and have the students make predictions on what they think will happen next. See if they can use the pictures and context clues to guess that the bald people will want the hairy giant's hair. Discuss as a class the predictions that the children make.CitationHiggins, R. (2013). Wilfred. Hudson Street, NY: The Penguin Group. I thought this book would be great for teaching children to treat each other with kindness because it tells the story of a friendship that begins with kindness. The little boy in the story approaches the monster, Wilfred, and becomes his friend even when everyone else is scared of him. Then one day when the villagers do something awful to Wilfred (they shave off all of his fur to make coats), the little boy goes in search of him. He is out hiding in his cave because he is too cold to come out and play. However, the boy does not come back. When the villagers go in search of him, they find Wilfred, hairless and huddled up in a ball, keeping the boy warm. The villagers see his bravery and kindness and realize that they were all wrong in how they thought about him. They make him a coat out of his own fur and make him a part of their community. It is a funny and also sweet story, and I think students would really like the illustrations, while also learning the importance of sacrifice for friends and kindness to those whom others are not kind to. An unusual tale about an unusual friendship. In a town where the residents are all bald, a young boy and a hairy giant become friends. The giant is generous to a fault and the residents of the town take advantage of his generosity when they convince him to shave his hair and use it to fashion wigs for themselves.Without his hair, the giant is too cold to play with the young boy and stays inside his cave to keep warm. When the young boy learns about his friend the giant's hair loss he makes mittens from his blanket and attempts to deliver them in the middle of a blizzard.When the boy finds himself cold and alone in the dark of the night, his friend the giant is there to keep him safe and warm. A quirky story with a happy ending. Illustrations were rendered in pen & ink and finished in Photoshop. This picture book has a wide appeal range as it's fun for the preK crowd, but the story almost has a Tim Burton-esque feel which would be a good independent read on up to 5th grade. Wilfred is a large and hairy beast that just wants a best friend. As he is searching for one he encounters an odd village of bald people. All the children run from his friendly advances except one brave young man. After a day of fun the two part ways promising to have even more fun the next day. However, some of the villagers intercept Wilfred and convince him to allow his hair to all be cut off. Now the sweet monster is too cold to play with his new friend and he retreats to his cave to warm up. The young boy searches for his missing friend only to find neighbors with wigs, evidence of Wilfred's current predicament. It takes some trying circumstances and heroic deeds for the two to be reunited. Wilfred is the story of a big, hairy monster who is not so monstrous after all. In fact, all he really wants in life is a friend. Unfortunately, all the strange little bald people in the town closest to his cave think he's scary and run away from him at first sight... except for one little boy. The pair becomes good friends, and look forward to carrying on their friendship, until the townspeople come up with a sinister plan of their own... This is a story about loneliness, friendship, sacrifice, heroism, and atoning for one's mistakes. The illustrations are cartoonish and fun, and the resolution of the story is satisfyingly sweet. 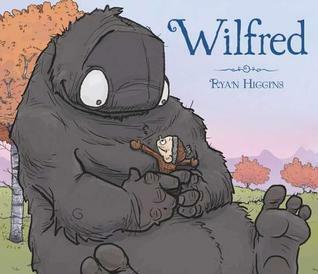 Plot: Wilfred is a lonely hairy giant who goes to a nearby town to make a friend. The only person who doesn't run away in fear is a brave little boy. Things are looking up for Wilfred until he returns to town to see his only friend and the town people who are hairless take advantage of Wilfred's kindness.Setting: UnknownCharacters: Wilfred, brave little boy, various town members.Point-of view: Third personTheme: Don't judge someone before you know them. Kindness.Style: Picture book, traditional story structure. Really nice story about diversity, acceptance and friendship. My elementary school students love it. Great illustrations. Wilfred is strange, funny, quirky, yet heart-warming. It was quite a strange mix. I shared it at an all ages storytime and it went over well. I also trimmed some of the wording as well. It's a longer book and I wanted to make sure to get through the whole story. I believe it was well received (with adult chuckles in the background). One young patron requested it immediately after storytime!2015 Theme: Giants (Every Hero Has a Story)Reviewed from a library book. I really enjoyed this book and thought it had a great message. It really focused on how we can find friendship in people that are different from ourselves and the importance of being a good friend. I was really drawn to this book when Wilfred rescued the little boy from the snow storm even though he didn’t have hair to keep himself warm. I would definitely recommend this book to other because it has a great central message and students can relate to it.